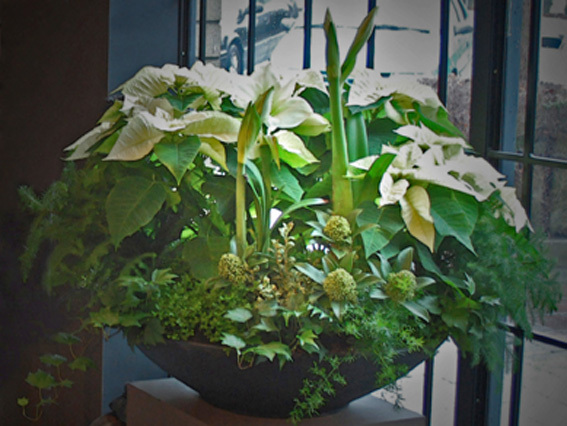 Christmas Design – Indoor and Outdoor Planters | Welcome! Almost anytime during the year I love fresh flowers. But at Christmas it’s a must! This arrangement is what greeted my guests as they came in from the cold. It was a fragrant arrangement as well. And, these are not cut flowers, but are actually small plants, potted into a very large, black shallow planter, without holes. 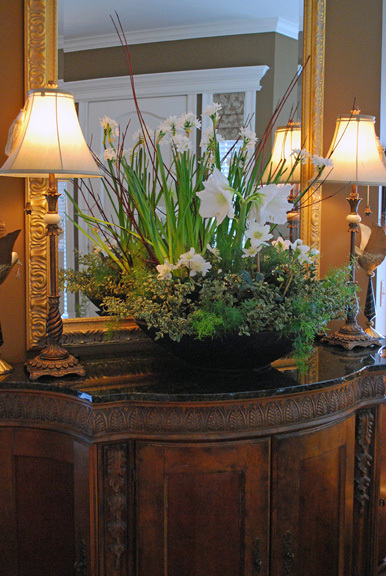 This means watering must be done with a great deal of care.By placing it in front of the large entry mirror, it looks even more welcoming. Below, is a close up of this same arrangement. I had been asked by a local art gallery, the White Rock Gallery if I would make them a live planter for one of their many Open Houses (which are absolutely the most wonderful affairs, with wine and cheeses done by a local catering company) in December. Below, you can see it sitting in their front window. 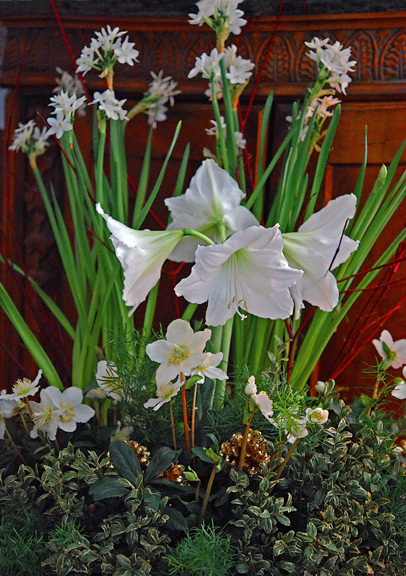 At first, the Amaryllis bulbs were very ‘spear-like’ and then, later they opened up to full-blown white flowers. 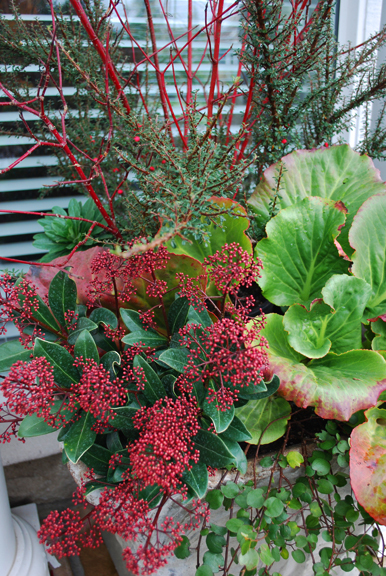 The tight green ‘balls’ at the front were Skimmia ‘Fragrant Cloud’. And of course, spilling over the edges were delicate ferns and ivy. 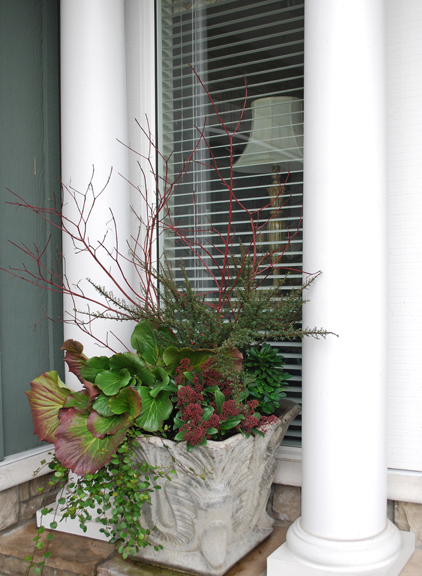 Meanwhile, outside at our own front entry, I had placed some tall branches of red-twig Dogwood, together with some evergreen plants which had been in these large planters from the previous season. They were Bergenias and Skimmias. Below is a close-up of the matching planter on the other side of the front door. Thanks so much for your very kind comments, Antonietta!!! slight rustic twist. (what a greeting) Your outdoor planters are a great way to bridge our Spring growing season. Leave it to Mother Nature to shower her beauty, color, texture and shapes on all growing things.